The accomplishments of Lewis and Clark and the Corps of Discovery amazes people even today. For today’s travelers, discovering the wonders of Lewis & Clark makes for a great adventure. Lewis and Clark and the Corps of Discovery arrived at the Columbia River in their dugout canoes on October 17, 1805. It was their final challenge to fulfill President Thomas Jefferson’s vision to discover and map out an all-water route to the Pacific Ocean. The swift current rocketed their dugouts downriver. On October 18th Co-Captain William Clark climbed the river bank and saw far off the snow-capped summit of Mount Hood. On the 19th, the canoes passed by the rugged outcropping formation Clark called Hat Rock. It is now a State Park. That same day they passed by the site of McNary Dam, which today provides navigable waters up to the Snake River. The Oregon Trail pioneers entered Oregon south of Ontario after crossing the treacherous Snake River. Today, directional signs and interpretive visitor centers at I-84 Rest Areas at Ontario, Farewell Bend State Park, and Weatherby prepare visitors for their detailed visit at the National Historic Oregon Trail Interpretive Center in Baker City. Inspiring exhibits, special events, and films provide insight into life on the Trail. At the Umatilla Valley pioneers could camp and rest or go to the Whitman Mission, now a National Historic Sitie managed by the Nez Perce National Historical Park, where they could buy provisions and trasde with the Cayuse, Umatilla and Walla Walla tribes liveing there. Today the tribes tells their story at the Tamastalikt Cultural Institute near Pendleton. The trail-weary pioneers had many challenges still ahead, crossing rivers and steep canyons to reach The Dalles, where they could board rafts or bateaus to ride the wild waters of the Columbia while the men and boys drove their oxen and horses along the narrow cliffs of the river. When Sam Barlow’s wagon train arrived at The Dalles in 1845, he knew there had to be a better way so he built a toll road around Mount Hood. 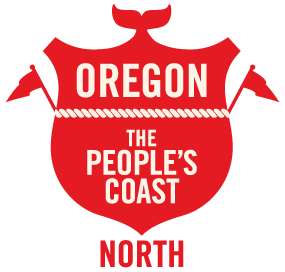 The route he blazed is part of the Oregon National Historic Trail. Name Your Pleasure! 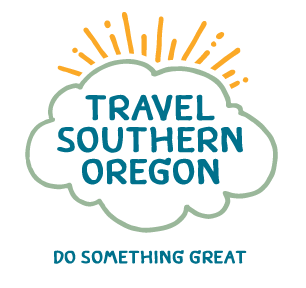 Using communities as your anchors along Interstates 84 and US 26, follow Eastern Oregon’s four Scenic Byways and one Tour Route as a guide and head out on your Road to Adventure! 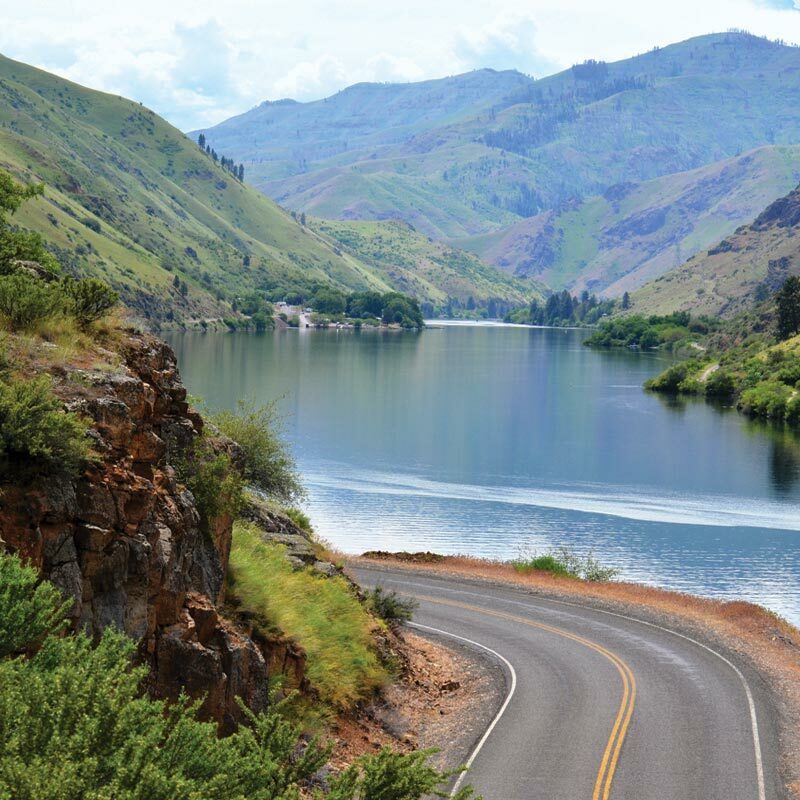 If you’re traveling east on I-84 along the Columbia, you can connect with US 97 at Biggs for the Journey Through Time Scenic Byway; OR-74 just east of Arlington for the Blue Mountain Scenic Byway; OR-82 at La Grande and OR-86 at Baker City for the Hells Canyon Scenic Byway; I-84 and US 30 at Baker City for the Elkhorn Drive Scenic Byway, and OR-82 just north of La Grande for the Grande Tour Scenic Bikeway. Step back into time where you can see both the Sheep Rock and Painted Hills units of the John Day Fossil Beds National Monument. 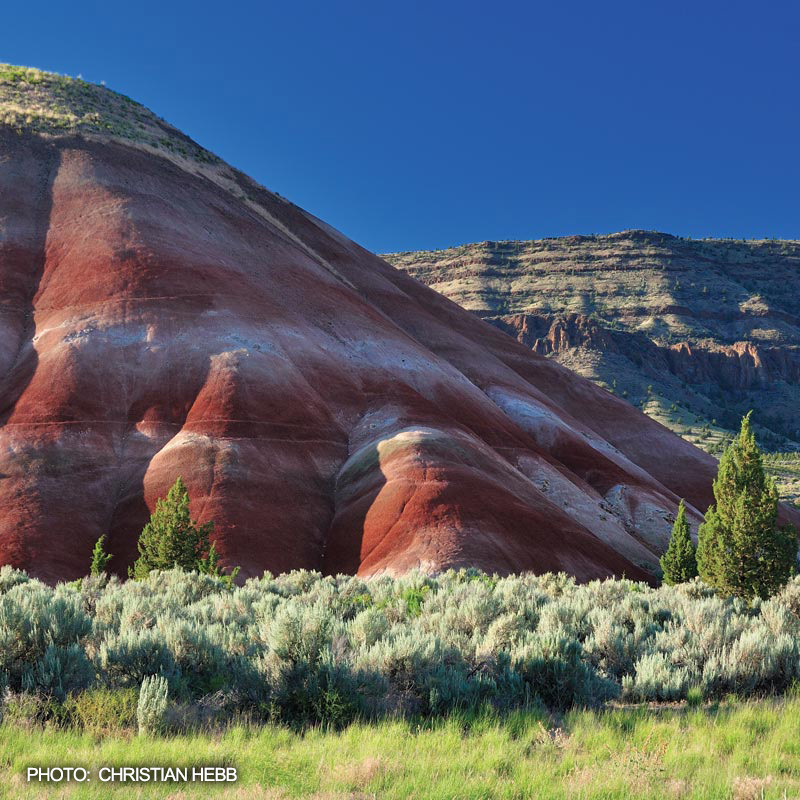 This byway begins at Baker City and continues west on US 26 along the John Day River where you’ll see the spectacular Painted Hills, one of the wonders of Oregon, just west of Mitchell. The Thomas Condon Paleontology Center is on OR-19, along with the rich agricultural area of Kimberly. This is an alternative route along this byway. Continue on Hwy 19 to Fossil and the John Day Fossil Beds National Monument Clarno Unit on OR-218. Head north on US 97 to the scenic wonders of Cottonwood Canyon State Park, joining I-84 at Biggs, just west of The Dalles. Vacationers driving north on I-84 from Ontario can relive the boom town days of Oregon’s Gold Rush in the 1870’s at Baker City. The splendor of the restored Geiser Grand Hotel reflects those glory days. The downtown and its 100 gold rush era historic structures are listed on the National Historic Register. Great places to shop and dine while enjoying locally crafted beer, wine, and spirits. Visual pleasures include art galleries, unique events and a reflection on the past at the Baker Heritage Museum. The National Historic Oregon Trail Interpretive Center just east of Baker City serves as a unique destination for reliving the days of the Oregon Trail. Re-enactments, multimedia displays, many authentic artifacts, and a four mile interpretive trail leads to some of the best preserved wagon ruts of the Trail. An All American Road that loops east from Baker City on OR-86 to Halfway and the Snake River Dam where visitors can sign up for jet boat trips which are a dynamic experience as are float trips through America’s deepest river gorge. During the summer months, the Hells Canyon Overlook off Forest Service Road 39 offers an incredible view-scape deep into the depths of the canyon. 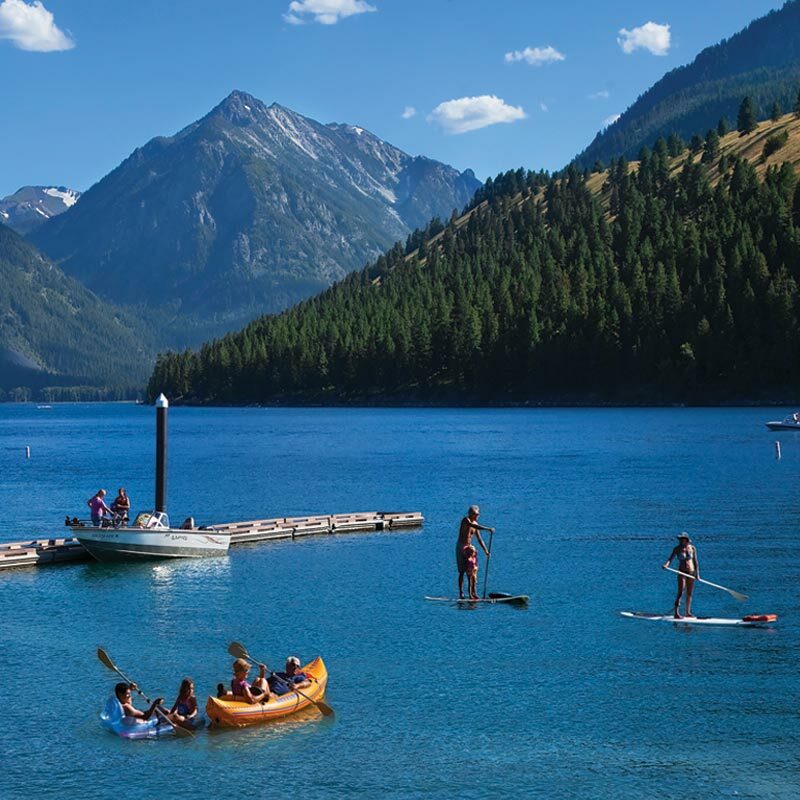 Traveling on you reach the ancestral home of the Nez Perce people (Nimíipuu) below the towering Wallowa Mountains, one of Oregon’s seven wonders and known as “Little Switzerland,” and at the base of Wallowa Lake. Note: Forest Service Road 39 is seasonal. Be prepared to share the road with livestock and bicyclists. The complex and marina provides boat rentals and cabins for vacationers. The nearby Alpine-themed village and lodge with gift shops, restaurants, and entertainment emporiums are a great experience. During summer months, the Wallowa Lake Tramway takes visitors up to Mt. Howard summit, providing incredible views of the lake and surrounding scenic vistas. The byway continues north to Joseph. Larger-than-life bronzes of cowboys and bucking horses frame Main Street. See the Alvin Josephy Center, and unique art galleries, gift shops, restaurants, and entertainment venues. 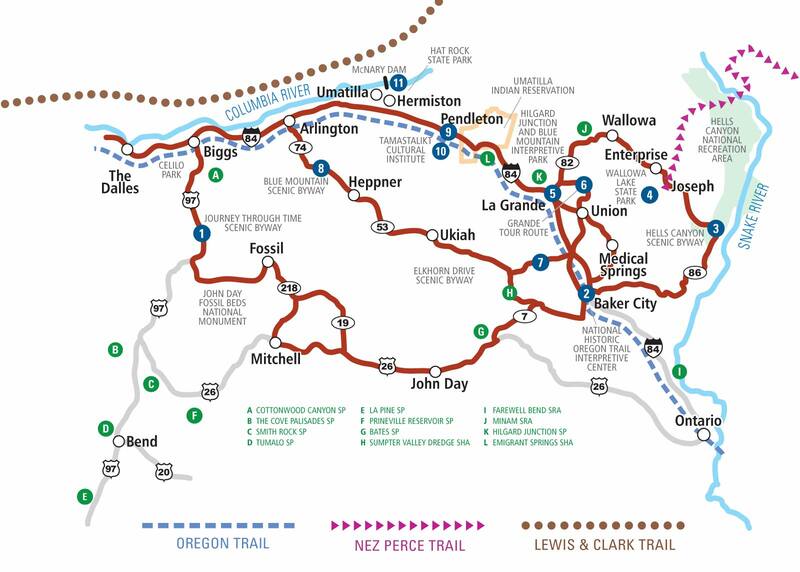 The Nez Perce (Nee-Me-Poo) National Historic Trail also begins at Joseph at the base of the Wallowa Mountains and heads north-east to Imnaha and then follows the Imnaha River to the Dug Bar Crossing. The Wallowa County Museum features the history of the Nez Perce, pioneers, and settlers. The town of Enterprise is also a fun place to spend time shopping, dining, or railriding. Stop in Wallowa to visit the Nez Perce Interpretive Center. Follow the the Wallowa River along Hwy 82 or catch the Eagle Cap Excursion Train in Elgin before turning south to Imbler and La Grande. Oregon Trail pioneers founded La Grande in 1865 and their pioneering spirit abounds today with robust events, along with locally flavored shopping and dining. The Art Center and the Old Library hosts concerts, art walks, and the annual Eastern Oregon Film Festival. The Union County Museum in nearby Union, portrays the region’s cowboy heritage with classic displays of saddles, western regalia, and a re-created 19th century town. 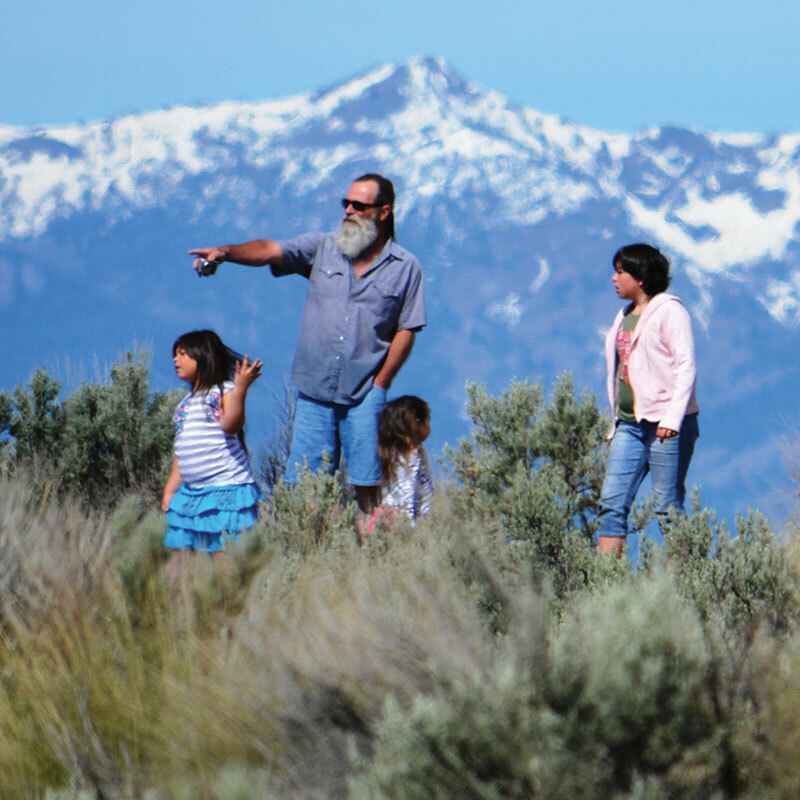 runs southeast of La Grande primarily on OR-203 connecting small towns, farm loops, and stunning views of the surrounding mountains. This tour route climbs into the pines of the Wallowa-Whitman National Forest and on to Catherine Summit before it descends to Hot Lake Springs and the Ladd Marsh Wildlife Area. Loops southeast of Baker City on OR-7 following the Powder River through rugged basalt canyons in the Wallowa-Whitman National Forest and past Phillips Lake, then continues on to gold country and the Sumpter Valley Dredge State Heritage Area. Vacationers can ride the narrow gauge Sumpter Valley Railroad through the gold dredge tailings to the town of Sumpter. The byway climbs to the gold town of Granite and on to the North Fork of the John Day, offering excellent camping opportunities. Here the route hooks up with the Blue Mountain Scenic Byway before climbing westward to beautiful Anthony Lakes and the Elkhorn Crest Trail for unparalleled mountain biking and hiking experiences. from Granite to Biggs via Ukiah, Heppner, and Lexington on OR-53 and 74 leads across ranchlands and forestlands, up and over mountains, and along fast flowing rivers and streams. Most everyone who visits Eastern Oregon heads for Pendleton on I-84, the epicenter of all things cowboy…and cowgirl, too! Plus, all the pageantry of the Native American people who have always been here. Pendleton is home to some of the leading crafts people who produce a number of unique creations from tailor-made saddles and western gear, to unique art pieces by local artists found at the Pendleton Center for the Arts. The Pendleton Woolen Mills is also known worldwide for its beautiful and functional blankets and fabrics. The famed Pendleton Round Up each September attracts the best cowboys in the world of rodeo. One of the nation’s best cultural institutions in presenting the heritage, culture, customs, and lifestyle of the Cayuse, Umatilla, and Walla Walla Tribes and is recognized as a Top Ten Western Museum Destination by True West magazine. Located at at Umatilla, the dam produces hydro-power and supports commercial navigation of the Columbia River north of Hermiston. At the Oregon Fish Viewing Room visitors can watch salmon wiggle and swim up through fish ladders on their way to spawning grounds upstream. Lake Wallula, the big reservoir behind the dam, attracts boaters, anglers, and windsurfers. Nearby scenic parks and McNary Wildlife Nature Area can be great places to enjoy a break from driving, too. Hat Rock State Park got its distinctive name from William Clark as he passed by in 1805 in a dugout canoe. Today’s travelers can feast on locally grown products from watermelon to succulent wines and locally crafted beer following several farm loops.